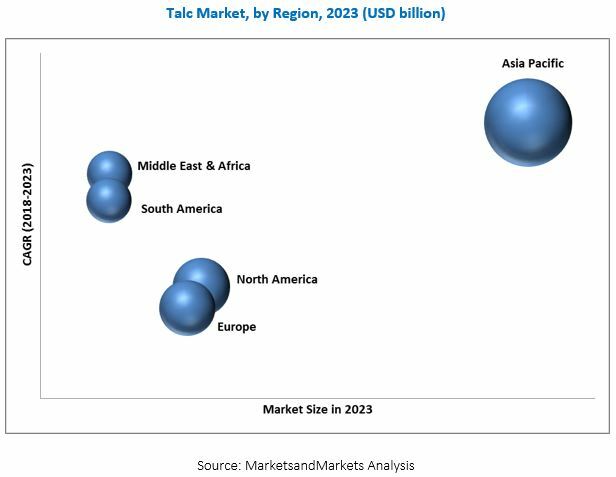 [164 Pages Report] Talc Market was valued at USD 2.57 billion in 2017 and is projected to reach USD 3.35 billion by 2023, at a CAGR of 4.6% during the forecast period. The research methodology used to estimate and forecast the global talc market began with capturing data on key vendor revenues through secondary sources, such as Hoovers, Bloomberg, Chemical Weekly, Factiva, and various other government and private websites. Vendor offerings have also been taken into consideration to determine market segmentation. After arriving at the overall market size, the total market was split into several segments and subsegments, which were later verified through primary research by conducting extensive interviews with key personnel, such as CEOs, VPs, directors, and executives. Data triangulation and market breakdown procedures were employed to complete the overall market engineering process and arrive at the exact statistics for all the segments and subsegments of the market. The breakdown of profiles of primaries is depicted in the figure below. 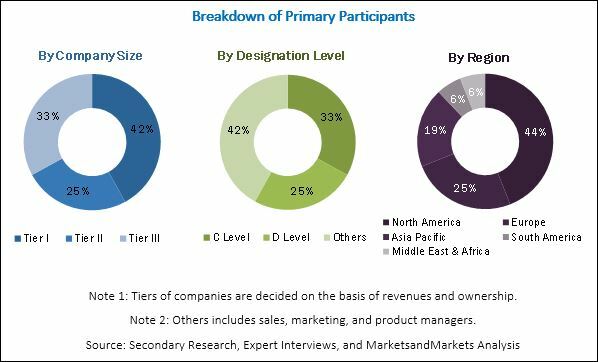 The talc market has a diversified ecosystem of upstream players, including raw material suppliers, along with downstream stakeholders, vendors, and government organizations. Companies operating in the talc market include Imerys (France), Mondo Minerals (Netherlands), Minerals Technologies (US), IMI Fabi (Italy), and Golcha Minerals (India), among others. This research report categorizes the talc market based on coating type, application, and region, and forecasts revenues as well as analyzes trends in each of the submarkets. Continuous advancements in technologies used in automobiles and increased demand for lightweight automobile parts have led manufacturers of vehicles to replace metal components in automobiles with plastic and composite parts. The use of lightweight plastic and composite parts reduces the overall weight of vehicles, thereby increasing their fuel efficiency. These lightweight plastic parts are made from talc-reinforced polypropylene, which enhances their performance and durability. Talc also offers resistance against abrasion and corrosion. In addition, the growing automotive refinish market and flourishing OEM components market for the automotive industry are also expected to drive the growth of the talc market across the globe during the forecast period. Rapid industrialization in emerging economies such as Thailand, Malaysia, Mexico, Brazil, Argentina, Russia, South Africa, China, and India is driving the growth of the talc market as talc is used in various end-use industries for a number of applications. The growing population and increasing disposable income of the middle-class population of emerging economies have led to the increased demand for various types of consumer products, such as cosmetics, ceramics, automotive plastic parts, and pharmaceuticals, which is, in turn, driving the growth of the talc market. The expanding manufacturing and services sectors in emerging economies are other factors fueling the growth of the talc market. Guidelines by different environment protection agencies across the globe to regulate the production and use of talc in various end-use industries are expected to hamper the growth of the talc market. These environment protection agencies have implemented various regulations across the globe to reduce the harmful impact of talc mines and processing plants on the environment. There are a number of Food and Drug Administration (FDA) regulations to monitor the use of talc as an anti-caking agent in the food industry. These FDA regulations only permit the use of asbestos-free talc in the food industry. According to the International Journal of Gynecological Cancer, it has also been proved that the frequent use of talcum powder by women can cause ovarian cancer in them. Moreover, talcum powder is associated with the respiratory issues in infants, and long-term exposure to it can cause pneumonia and asthma symptoms. The pulp & paper industry has been growing at a slow pace across the globe due to digitization, which has reduced the demand for graphic papers. The growth of the pulp & paper industry has been slower in North American and European countries as compared to countries in the Asia Pacific region, which is expected to restrain the growth of the talc market. Moreover, talc is being replaced by biotechnological solutions in applications such as pitch control in the pulp & paper industry. These biotechnological solutions use enzymes or fungi for pitch control. Hence, the use of talc in the pulp & paper industry has declined, thereby leading to the decreased demand for talc from this industry. The global talc market is projected to grow from an estimated USD 2.68 billion in 2018 to USD 3.35 billion by 2023, at a CAGR of 4.6% from 2018 to 2023. Talc is also used as a coating agent in rotogravure and offset papers, wherein it improves the runnability of offset papers and the quality of finished papers. It is also used to improve the quality and productivity of certain specialty papers, such as colored papers and labels. Among regions, Asia Pacific is projected to lead the talc market in terms of value. The growth of the Asia Pacific talc market can be attributed to rapid industrialization, growth of the automotive sector, and increasing demand for talc from the cosmetics & personal, ceramics, paints & coatings, and pharmaceuticals end-use industries in the region. The talc carbonate segment is projected to be the largest deposit type segment of the talc market from 2018 to 2023. Talc carbonate ores are processed to remove associated minerals to produce pure talc concentrate. Talc carbonate ores are generally found in metamorphic ultramafic rocks. The plastics segment is estimated to be the largest end-use industry segment of the talc market in 2018. Talc is used as an anti-blocking agent in polyethylene and helps restore mechanical properties of recycled plastics. Talc is also used as a nucleating agent in biopolymers and semi-crystalline polymers. In the automotive industry, the use of talc in polymer compounds helps stabilize fenders and develop dashboards that are highly scratch-resistant. Talc also increases the modulus of elasticity, impact resistance, dimensional stability, color consistency, scratch resistance, creep strength, and low abrasion in plastic components. The Asia Pacific is expected to be the fastest-growing market for talc during the forecast period. The growing middle-class populations with high disposable incomes and increasing demand for consumer goods and consumer durables are major factors contributing to the growth of the talc market in this region. Slow growth of the pulp & paper industry, and lawsuits filed against the production and use of talc are the key restraints in the talc market. Key players operating in the talc market include Imerys (France), Mondo Minerals (Netherlands), Minerals Technologies (US), IMI Fabi (Italy), Golcha Minerals (India), and Nippon Talc (Japan), among others. These companies focus on enhancing their product portfolios to grow in the talc market. The potential applications of talc are virtually infinite, and continuous R&D activities in the talc industry are expected to help in discovering new applications. R&D activities are being carried out in the talc industry for the development of new grades of talc for use in barrier coatings in paperboard food packaging for the food industry. Extensive research is being carried out to develop coating talc to improve the printability of rotogravure papers; low abrasion talc to carry out polypropylene pipe extrusions; and double-classified talc to develop low Volatile Organic Compound (VOC) coatings, among others. Hence, there is high scope for the development of innovative grades of talc for use in the pulp & paper and food industries. The Asia Pacific region is a potential market for talc due to the increased demand for talc from the emerging economies of China and India in the region. The Asia Pacific region is a favorable destination for foreign investments due to the easy availability of raw materials and low-cost labor. China and India are among the top producers of talc globally. The Asia Pacific region is a major producer and exporter of talc across the globe. The growth of the pulp & paper, automotive, plastics, paints & coatings, cosmetics & personal care, ceramics, agriculture, and food industries, which are the major consumers of talc in the Asia Pacific region, is expected to offer opportunities for the growth of the talc market. Thousands of lawsuits have been filed across the globe against the use of talc in cosmetic products by people suffering from ovarian cancer or mesothelioma after using these products. By late 2017, different juries across the globe awarded penalties of over USD 700 million in verdicts against the manufacturers of talc-based cosmetic products, such as baby powder, and the companies supplying talc to end-use companies manufacturing these cosmetic products. Thus, lawsuits against the use and production of talc have created the image of talc being an unsafe product, especially in the cosmetics industry. The producers of talc and their end-use companies, however, have denied the charges against the carcinogenic nature of talc. Hence, lawsuits filed against the production and use of talc act as challenges for the growth of the talc market across the globe. The company launched a new grade of Mondana. Mondana is a 100% natural, pure, and ultra-fine talc. It is colorless and unperfumed. This launch has helped the company in expanding its talc product portfolio for cosmetic applications. The company launched a new product, Nicron 674C talc, for the plastic compounding industry. This launch has helped the company expand its talc portfolio for Polypropylene (PP) and Thermoplastic Olefin (TPO) polymer compounds. IMI Fabi acquired Sibelco’s talc operations located in Uikhoven, Belgium. The acquisition is expected to help IMI Fabi improve its product portfolio of talc products. IMI Fabi acquired the talc business of RHI Magnesita located in Bahia, Brazil. This helped the company enhance its presence in Latin America. IMI Fabi appointed Omya as the distributor for talc for paints, coatings, adhesives, sealants, construction, and paper applications. This helped the company enhance its presence in Europe. The company signed an agreement with MONACHEM Additives Pvt. Ltd., a company headquartered in Vadodara, India to sell and distribute IMI Fabi talc products throughout India to the petrochemical, plastics, paints, and agriculture markets. This agreement helped the company expand its business in India. Liaoning Aihai Talc formed AIHAI Minerals Europe GmbH, based in Kammern, Austria. The company is expected to be responsible for Liaoning Aihai Talc’s sales activities in the European region. This is expected to help the company service its existing customers and gain new customers in Europe.